Siri, FaceTime HD Camera, iSight Camera, 1080p HD Video Recording, Touch ID fingerprint sensor There’s more to mini than meets the eye. 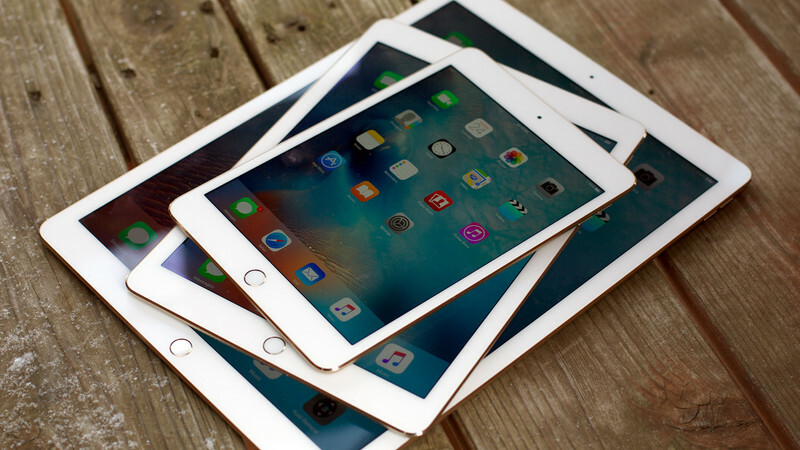 The new iPad mini 4 puts uncompromising performance and potential in your hand. It’s thinner and lighter than ever before, yet powerful enough to help you take your ideas even further. Features: •	7.9-inch Retina display with anti-reflective coating •	Touch ID fingerprint sensor •	A8 2nd generation chip with 64-bit desktop-class architecture •	8 MP iSight camera (1080p) •	FaceTime HD camera 802.11n Wi-Fi with MIMO •	Up to 10 hours of battery life* •	2 speaker audio *Battery life varies by use and configuration. See www.apple.com/ca/batteries for more information. Apple Pencil for iPad Pro and 6th Generation iPads - White Features: Pressure and Tilt Sensors, Virtually No Lag, Highly Intuitive Completely familiar. Entirely revolutionary. With its pixel-perfect precision, Apple Pencil expands the power of Multi-Touch and opens up creative possibilities*. It’s sensitive to both tilt and pressure, allowing you to create a range of artistic strokes and effects – from the thinnest of lines to subtle shading Beyond Multi-Touch •	Apple Pencil enhances the versatility of Multi-Touch by providing added precision for tasks such as writing, drawing or annotating. Virtually No Lag •	Designed along with iPad Pro and iOS, it’s precise enough to touch a single pixel, and so responsive that there’s virtually no delay between what you draw and what you see on the screen. 12 Hours of Battery Life •	Delivers 12-hour battery life, and when you need to charge you can plug the Lightning connector into iPad Pro**. Highly Intuitive •	iPad Pro knows whether you’re using your finger or Apple Pencil, so you can use both at once on the screen. Pressure and Tilt Sensors •	Built-in pressure and tilt sensors can detect how much pressure is being applied and the angle relative to the screen, so iPad Pro can tell the difference between a light press, a deeper press and a tilt. iOS 9 •	Make the most of iOS 9 when you use Apple Pencil with built-in apps. Apple Pencil will also work with iPad apps from the App Store. What’s in the box •	Apple Pencil •	Apple Pencil Adapter •	Extra Tip *iPad Pro sold separately. **Testing conducted by Apple in September 2015 using preproduction Apple Pencil and iPad Pro units and software. Testing consisted of full battery discharge while drawing on a paired iPad Pro using automated equipment. Battery life depends on device settings, usage and many other factors. TM and © 2015 Apple Inc. All rights reserved. Features: Siri, FaceTime HD Camera, iSight Camera, 1080p HD Video Recording, Touch ID fingerprint sensor The 9.7-inch iPad Pro delivers an unprecedented combination of portability and performance. At just 6.1 mm thin and weighing less than 500 grams, iPad Pro features the brightest, most advanced Retina display ever with True Tone, advanced sensors that adjust the display to your environment for even more comfortable viewing. It has a powerful A9X chip with 64-bit desktop-class architecture, four speaker audio, advanced iSight and FaceTime HD cameras, Touch ID fingerprint sensor, ultrafast Wi-Fi and LTE Advanced connectivity,1 and up to 10 hours of battery life.2 Key Features: •	9.7-inch Retina display with True Tone and anti-reflective coating (diagonal) •	A9X third-generation chip with 64-bit desktop-class architecture •	Touch ID fingerprint sensor •	12MP iSight camera with 4k video •	5MP FaceTime HD camera •	802.11ac Wi-Fi with MIMO •	Up to 10 hours of battery life* •	Four speaker audio * Battery life varies by use and configuration. See www.apple.com/ca/batteries for more information.